We, humans, are born with Black, Brown or Blonde Hair, as time passes on, it grows to its best and thickest till 25 years but later on, some may not be as fortunate as they should be to possess that natural’s gift, due to various reasons. It may heredity disorder, Pollution, Stress or even lifestyle and eating habit etc. Hair falls and hair loss can be a devastating and daunting experience one may experience, it let you morally down and the sufferer may feel low and cast out. We at Hair Speak tackle all these challenges and bring back what natures best ever gift which has been lost and put a smile on our client’s face. We have a dedicated team of experts who are well versed in Hair transplant techniques. 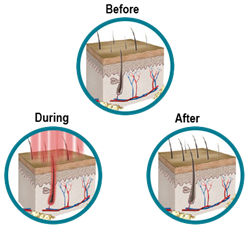 Unlike FUT, FUE (Follicular Unit Extraction) has a different procedure, individual follicular units containing 1-4 hair strands at a time, are extracted directly from the donor space scalp under anaesthetic’s presence and place it on receiver space, similarly to the FUT. This technique is suitable for both men and women, as a treatment for any sort of hair loss on all bald spaces. This is the best techniques for those patients who don’t want a linear scar on the donor space, especially for young patients it only needs minor treatment on compared to FUT. For a free consultation get in touch with Hair Speak, the Best Hair transplant Studio in Bangalore please feel free to book your appointment.